While attending the NCAA Men’s Basketball Final Four Tournament in Houston recently, 240 coaches’ wives acknowledged that March Madness isn’t just about basketball. During an annual program called The Gathering, coaches’ wives representing colleges and universities from all over the nation and from every competitive division took time to recognize and give to Mercy Multiplied’s work and mission. 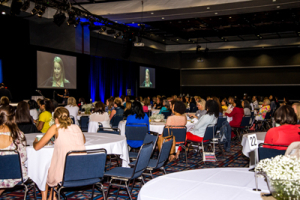 Since 2007, The Gathering has been a way for coaches’ wives attending the National Association of Basketball Coaches’ Convention at The Final Four to connect with other coaches’ wives and be encouraged, inspired, and challenged by a creative program of guest panelists and keynote speakers. 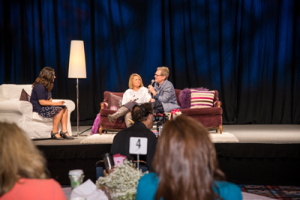 As the event grew in attendance each year, The Gathering planning committee saw the need to not only bless coaches’ wives, but also provide an opportunity for coaches’ wives to be a blessing. In 2015, The Gathering began investing in Mercy Multiplied and encouraging others to join in supporting Mercy’s life-transforming work among young women across America and around the world. 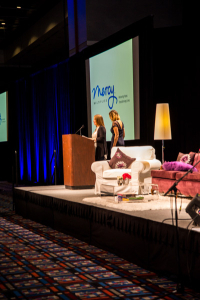 Coaches’ wives heard from Mercy’s Founder and President, Nancy Alcorn, who was the featured keynote speaker for the 2015 program and inspired many by her commitment to serve hurting and broken young women. In this year’s program, The Gathering attendees heard from 2004 Mercy graduate Liesel. 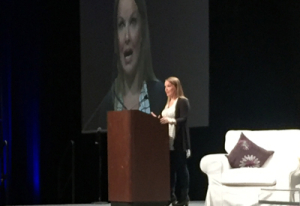 Liesel shared how her turbulent upbringing culminated in a life-controlling drug addiction. She described the instability and pain her addiction caused in her life and relationships. Through the Mercy Multiplied program, Liesel received the tools and perspective she needed to break free from her addiction and its destructive cycles. She shared how the hope and restoration she found in Christ is now being multiplied in her marriage and family more than a decade after her graduation from Mercy. At the end of The Gathering program, which also included a panel discussion of coaches’ wives and a feature interview with Steven Curtis and Mary Beth Chapman, guests were provided an opportunity to give to Mercy. Mercy is grateful for the support and generosity of The Gathering. For more information on The Gathering, click here. To learn how you or your organization can partner with Mercy Multiplied, click here.